Interface with MCAC in new ways! THE INTERACTIVE MAP – Visually find an artist’s booth location in the park with a simple search on your smart phone. Plus, look for wayfinding visuals in artist booths to help you keep your bearings as you tour the around the Festival. PLAY AUDIO – Go in depth with some of our exhibiting artists, in their own words, and voiced by a handful of Birmingham narrators. 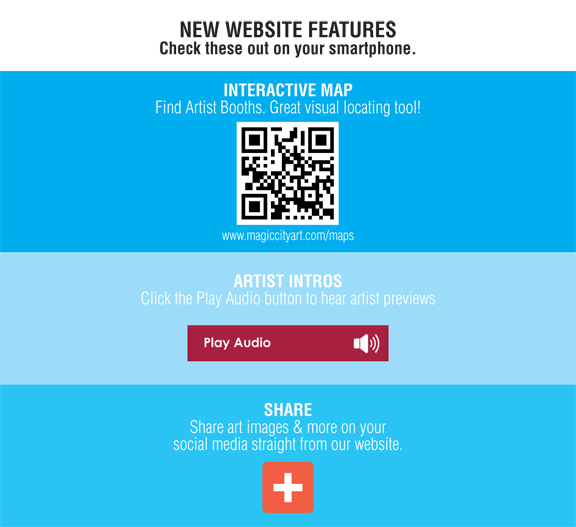 Take an artist audio tour around the festival with your smart phone. We recommend bringing along your ear buds. SHARE – festival programming info, the work of your favorite artists, and more directly from our website. Special thanks to Kinetic Communications for keeping the festival moving towards a bigger, more connected, and highly interactive future. Enjoy some delicious eats, grab a cocktail, contemplate an art purchase, chat with your friends and neighbors, rest and recharge for more art, or just people watch as the day goes by. Linger with us at the Park Place Cafe and expanded Visitor Lounges. 6) Private al fresco diningVIP tickets will be granted access to this premier area and all of its exclusive offerings including a special food tasting, additional select wines, craft beer and champagne to taste, lounge seating, and private al fresco dining. On Sunday, April 26 the VIP Lounge boasts a special BBVA Compass VIP Experience featuring a prestigious visit from the World’s Best Pastry Chef, Jordi Roca of World Famous El Celler de Can Roca in Girona, Spain. This extraordinary honor was awarded to Pastry Chef Roca in 2014 by the World’s 50 Best Restaurants. Chef Roca will mingle with VIP patrons, Culinard students and area chefs, plus demoing a couple of his amazing dishes in the VIP Lounge. Get a detailed rundown of the offerings each day and ticket prices, click here.